Sleek Metal Base Finished In A Plated Brushed Dark Bronze. The Suspended Round Hardback Shade Is A White Linen Fabric With Light Slubbing. This Lamp Features An Adjustable Shade Arm And A Pivoting Shade. 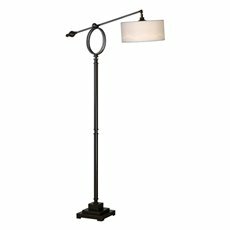 Frame: Sleek Metal Base Finished In A Plated Brushed Dark Bronze Featuring An Adjustable Shade Arm.